This safety notice describes the dangers of undetected corrosion in trunnion supports of pipework containing hazardous substances, in particular tubular trunnions fitted with an end cap, and the precautions necessary to ensure continued safe operation. Pipework support trunnions are common in petrochemical installations, where short lengths of tube are welded to process pipework as a means of supporting from structural steel. Various configurations are shown in Figure 1. A release of Liquefied Petroleum Gas (LPG) occurred on a UK refinery during processing, leading to a controlled shutdown and isolation of the associated vessel and pipework. Further investigation revealed that corrosion had occurred within the trunnion supports for the pipework, with a gradual loss of wall thickness on the LPG pipe. The tubular support had been fitted with an end cap, forming a closed end, which in theory eliminated moisture ingress, but the trunnion also had a weep hole drilled on the underside to allow for venting. This hole was sited directly on support steelwork. As a result, the void within the trunnion gradually drew in moisture, which then condensed on the pipe wall. This in turn led to accelerated localised corrosion of the pipe. As this corrosion mechanism was not anticipated, it remained undetected until the pipe wall eventually ruptured under internal pressure. The arrangement is represented in Figure 2. The company have conducted further investigations on site, and have found other instances of the same corrosion. This has led to immediate replacement in some cases. In total, almost 5% of the site population of trunnions has had to have some remedial work. 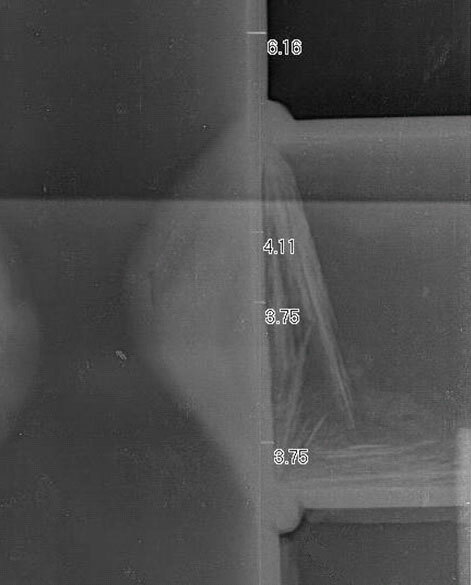 An example radiograph of the corrosion found is shown in Figure 3. Operators of plant with pipework containing hazardous substances should ensure that their inspection regime includes suitable examination of supports. In particular, where tubular trunnions are installed with an end cap that prevents visual examination, other means should be employed to ensure the integrity of the system where there is a possibility of moisture ingress. Note that permanent removal of the end cap is not recommended without further design work, as the cap may be required for additional stiffness. Please pass this information to a colleague who may have this product/equipment or operate this type of system/process.